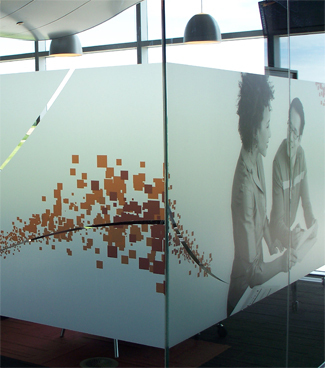 Lintec Graphic Film can transform your glass into a vibrant canvas. It is ideal for corporate branding, privacy, decoration, identification, advertising, manifestation, and safety. Lintec Graphic Film permits the incorporation of any number of colours to create vibrant eye-catching glass surface treatments, printed graphic designs, and corporate branding. A range of specifications including printable clear, printable one-way vision, privacy and view-control are available. Light transmission, colour, and positioning can be tailored to fit the nature of the space. A high-specification self-adhesive coating ensures installation and removal are both quick and clean, resulting in minimal disruption to the working environment.